A few years ago I got a heavy barrel target version of Ruger MKIII at Cabela's. I loved the pistol. It came with fully adjustable sights and scope mount - and the iron sights even worked when the scope mounting bracket was installed. It was supremely accurate, predictably putting 10 shots in 1" diameter circle at 25 yards. It had a nice trigger. It felt good - substantial, but not overly heavy - in my hand. The love affair was put on hold the first time I tried to disassemble it. Well, the disassembly itself was easy - the problems started when I tried to put it back together. For the next 2 hours I cursed Ruger engineers, scoured the internet for instructions, and peered hopelessly into the manual. Unfortunately, everything worked great on videos, and the manual was very clear, but MY parts positively refused to fit together. Until I finally gave up on videos and the manual and tried to understand how this thing REALLY works. And after that everything snapped together easily. So for a while I nourished the idea to post a tutorial on how to field strip and - most importantly - reassemble my Ruger pistol. 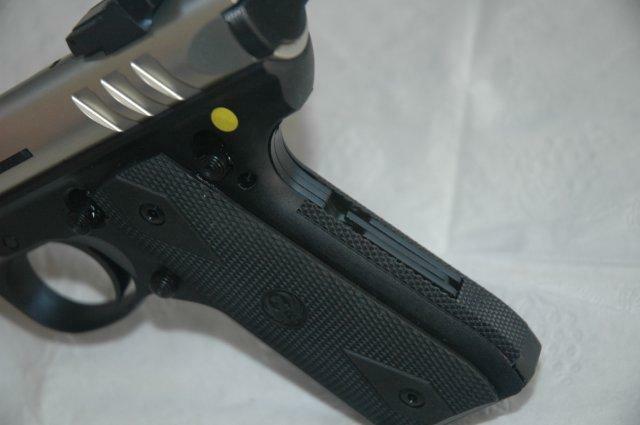 The final impetus came when I got my hands on a Ruger 22/45 "Lite" and decided to review it. 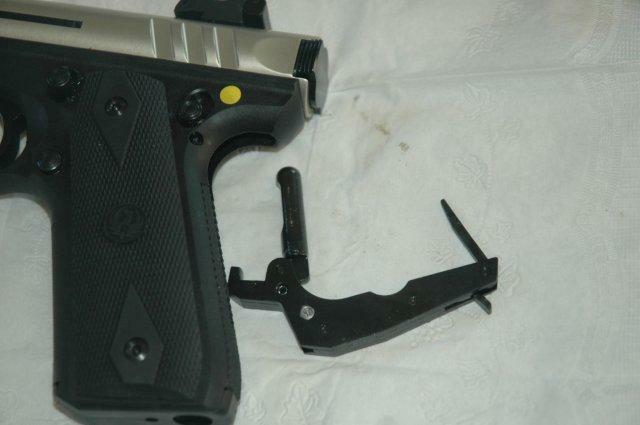 And what good would the review be if it did not address the main problem with these pistols - namely, the disassembly. I quote it mostly by providing the anchor points for my annotations. Please, do read the manual in its entirety and follow it carefully! MANUAL: 1. 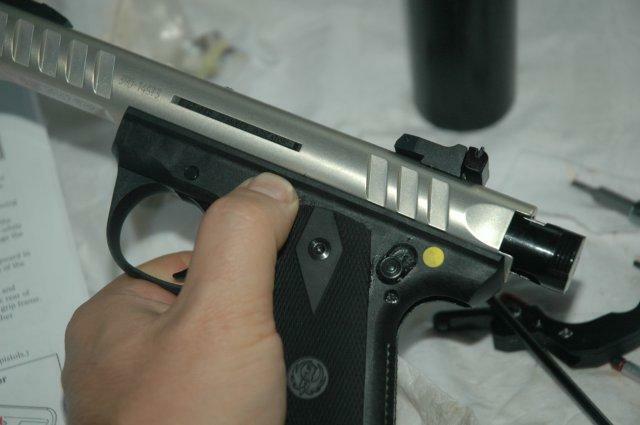 Before beginning disassembly, be certain that the muzzle is pointed in a safe direction and that the safety is "on" (S) if the pistol is cocked. Remove the magazine and carefully check it to verify that it is completely empty. Draw the bolt fully rearward and visually inspect the chamber to be certain that there is no cartridge in it and then release the bolt. Insert the empty magazine into the magazine well until it "clicks" and is fully in place. Disengage the internal lock, if necessary. (See p. 13.) Place the safety in the "off" (F) position. Point the pistol in a safe direction and pull the trigger to be sure the hammer has fallen. The hammer must be uncocked before the pistol can be disassembled. Remove the empty magazine. ME: This last part about dry-firing the pistol is really important - if you don't do it, the next step will fail! ME: I just use a screwdriver. So far it does not seem to have marred anything. MANUAL: 3. Swing the entire housing outward on its pivot and pull downward, removing the mainspring housing and bolt stop pin. 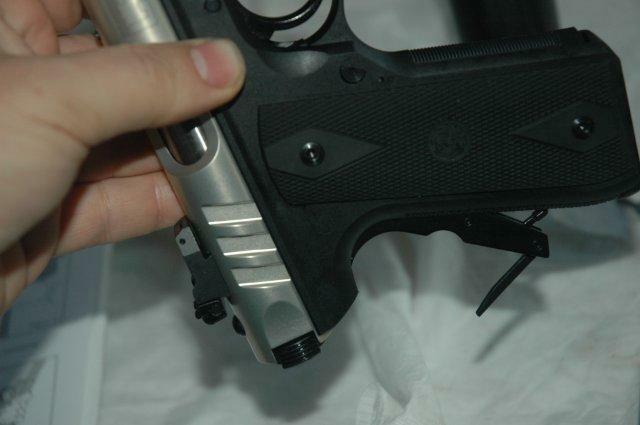 With new pistols it may be necessary to lightly tap (with a plastic hammer and wooden dowel) on the top portion of the bolt stop pin—which protrudes above the receiver—while pulling downward on the mainspring housing. Be careful not to damage the rear sight. ME: I found that just wiggling the mainspring out by turning it slightly back and forth and pushing it down works fine, but tapping it out with an appropriately sized wooden dowel works great, too (I bought a bunch of them, different diameters, at Home Depot once, and pieces of them have proven to be invaluable in all kinds of firearms projects). MANUAL: 4. Fully insert the empty magazine into the frame. Point the muzzle upward in a safe direction and pull the trigger rearward. The bolt will drop out of the receiver or it can readily be removed. Remove the magazine. ME: What this acrobatics actually does is having the hammer drop down and get out of the bolt's way. On my pistol it wouldn't do it on its own, so the bolt wouldn't come out. I used magnetic screwdriver to pull the hammer down instead. 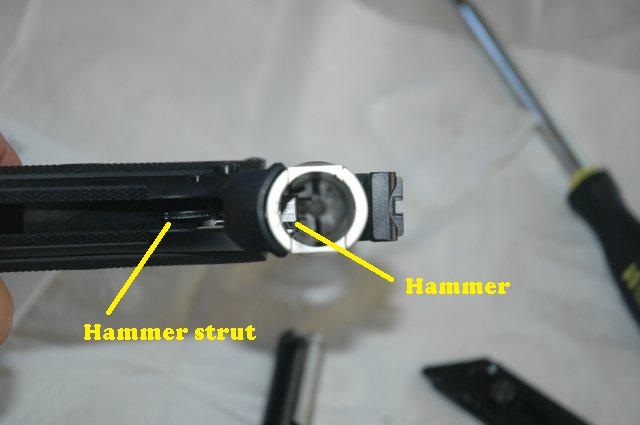 Here you can see the hammer strut looking through the opening left by the mainspring, and the hammer itself is the flat piece visible through the receiver opening where bolt was. Here it is again. Remember this component, it is CRUCIAL for reassembly! MANUAL 5. 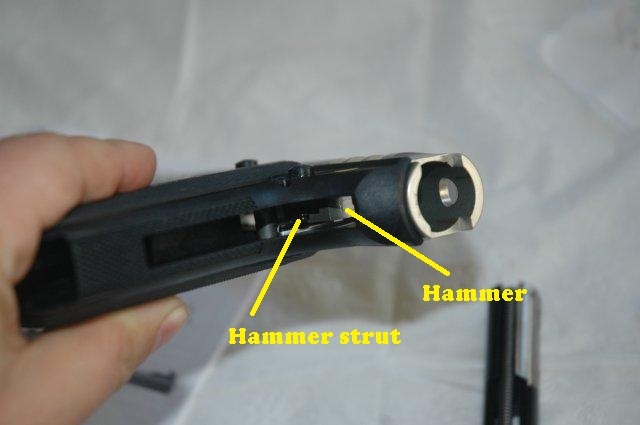 With the mainspring housing, bolt stop pin, (as an assembly), bolt and magazine removed, a forward blow (with a plastic hammer) on the rear of the receiver will disengage the barrel-receiver assembly from the grip frame. No attempt should be made to remove rivets or staked pins. Further disassembly should be undertaken only by the factory. ME: If you really insist. In actual fact, this step does not make it any easier to clean the gun, so I usually skip it. ...so this was really, really easy. Now on to the hard part. MANUAL: 1. Be certain the pistol is free of cartridges! The safety must be in the "off" (F) position for reassembly. ME: The first part of this is idiotic. How would cartridges make it into a disassembled pistol??? And that, unfortunately, makes it easy to overlook the crucial part - if the safety is not in "F", the hammer won't turn in step 4, and the hammer strut won't move into the right position on the mainspring housing! MANUAL: 2. Keep your finger off the trigger. Place the hammer in the horizontal (cocked) position. 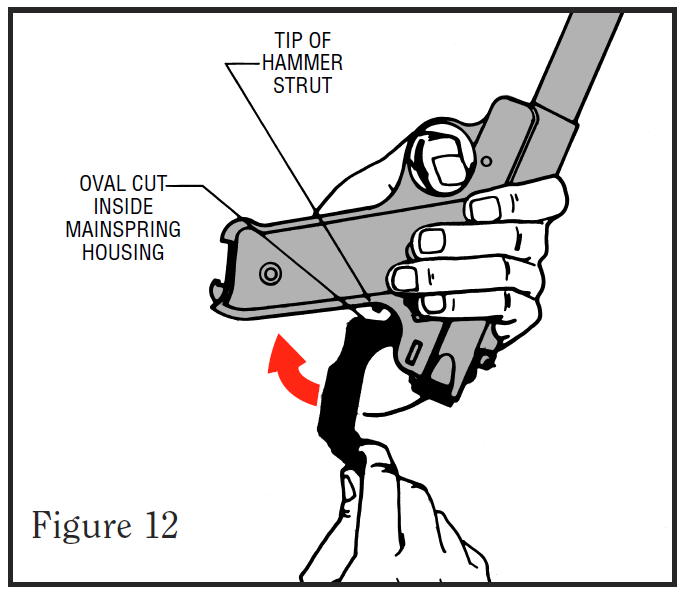 MANUAL: If you cannot place the hammer in the horizontal position, it is most likely because the hammer strut is trapped behind the crosspin (see Figure 7 – not applicable to 22/45 models). If this occurs, lift the hammer to free the hammer strut from behind the crosspin and then move the hammer into the horizontal position. MANUAL: If the hammer has been rotated too far forward, it also may be difficult to rotate backwards. 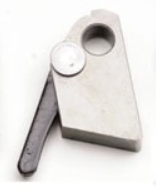 Inserting the empty magazine fully into the magazine well will allow the hammer to rotate backwards into a horizontal position. Once the hammer is horizontal, remove the empty magazine. 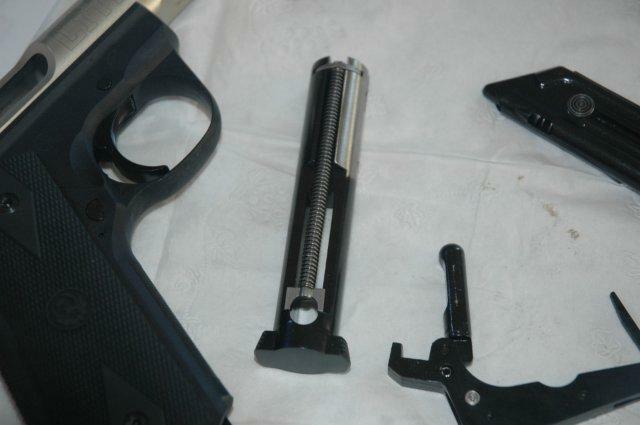 MANUAL: Before placing the barrel receiver onto the frame, make sure that the loaded chamber indicator pin (Part No. A02611 / Key No. 7 in the exploded view drawing on p. 39) has not fallen out of the receiver. MANUAL: 3. Place the barrel receiver on top of the frame so that the square lug engages the square front recess on the underside of the receiver (see Figure 8A). 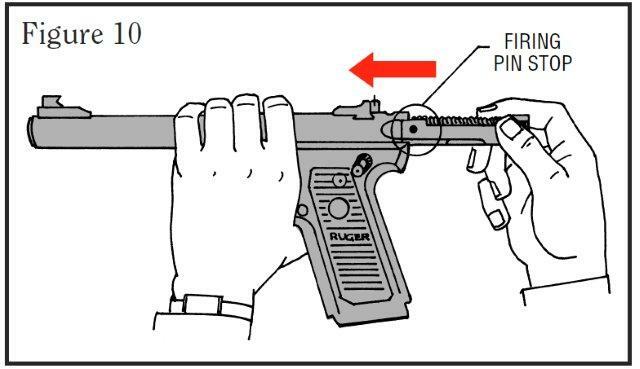 Push the barrel rearward until it stops, with the rear end of the receiver slightly overhanging the rear end of the grip frame (see Figure 8B). If alignment cannot be achieved by hand pressure, place the pistol (muzzle down) on a padded bench and strike the rear of the grip frame immediately below the receiver with a plastic or wooden mallet. Be careful not to damage the grip frame. MANUAL: 4. Fully insert the empty magazine back into the magazine well. Point the muzzle up in a safe direction and pull the trigger. Gravity should cause the hammer to return to the cocked position if it became dislodged in step 3 (see Figure 9). If not, reach into the rear of the receiver and push the hammer back down flat (into the horizontal position). When the hammer is in this position, remove the empty magazine. ME: In my two pistols gravity never work. Just level it out by hand. If it does not turn, you forgot to put safety on "F"! Again, pay attention to the strut. It can be lodged behind the cross pin preventing the hammer to go all the way down. Wiggle it out. MANUAL: 5. NOTE: Before sliding the bolt into the receiver, BE CERTAIN that the firing pin stop (part number A03500, a small pin) is in the bolt. (See Figure 10.) Without this pin, the first time the trigger is pulled on an assembled pistol, the firing pin will fly forward so far as to irreparably dent the rear end of the chamber of the barrel, making the pistol useless. 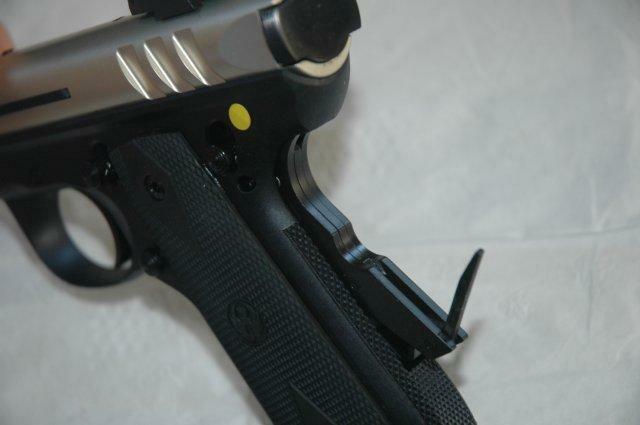 Now, slide the bolt (with the recoil spring upward) fully forward into the receiver. ME: Failure to pay attention here can ruin your pistol! ME: The bolt is in! MANUAL: 6. Insert the empty magazine into the magazine well, point the muzzle toward the ground in a safe direction and pull the trigger. The hammer should fall to its full forward position. If it does not, retract the bolt partially and manipulate the hammer through the slot in the rear of the frame until the hammer is in its full forward position. ME: It won't (gravity does not work here, unless it's a fully polished factory sample), and don't bother with retracting the bolt. Instead use a pen or a screwdriver to simply push the hammer forward. Pay attention to the magazine: it should be in at this point, or else nothing will work! MANUAL: Point the muzzle toward the ground. 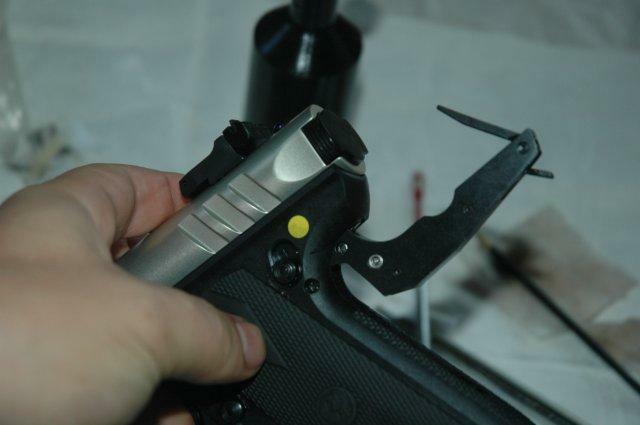 With the pistol in this position, hold the mainspring housing bolt stop pin assembly and press the bolt stop pin through the holes in the receiver and bolt until the tip of the pin protrudes beyond the top of the receiver. (See Figure 11.) You may need to tap the mainspring housing into position with a rubber or wooden mallet. The pin must be fully in place to close the latch in Step 8. Do not yet move the mainspring housing into the frame. MANUAL: 7. (For 22/45 models, skip to 7A.) Now invert the pistol so that the muzzle is pointed upward. Make sure you can see the hammer strut when you lift the housing up. The hammer strut should go into the oval-shaped cut inside the mainspring housing. (See Figure 12.) Hold the trigger to the rear. MANUAL: While holding the pistol in this position and depressing the trigger, move the mainspring housing into its proper place in the frame. ME: Note that the picture in the manual is incorrect - it is CRUCIALLY important that the magazine is in. If it's not in at this point, you will be able to insert the mainspring and even close it - but when you try to pull back the bolt, it will get stopped about 1/2 out. MANUAL: 7A. For 22/45 models ONLY: Now invert the pistol so that the muzzle is pointed upward. Make sure you can see the hammer strut when you lift the housing up. The hammer strut should go into the oval-shaped cutout inside the mainspring housing (see Figure 12). While holding the pistol in this position and depressing the trigger, close the mainspring housing as far as it will go without excessive pressure. Holding the mainspring housing in this position, release the trigger and remove the magazine. Once the magazine is removed, the mainspring housing will close the rest of the way. MANUAL: 8. The housing latch can now be snapped shut, completing assembly. (See Figure 14.) Spring pressure should be felt just before the housing is fully shut if the internal parts are correctly aligned. MANUAL: 9. To determine if reassembly was performed correctly, pull the bolt backward and verify that it opens fully. If not, open the latch and repeat steps 6 - 8, above. ME: If the bolt does not open, you neglected to have the magazine in during 7 or 7A. ME: ...and, we're done! Note that this says - explicitly - that Ruger MK pistols are safe to dry fire. Yay!